The first 3 years of a child’s life are some of their most crucial. It's during this time that your toddler is beginning to learn crucial skills that they will carry through life. Teaching your toddler musical skills during this early phase of their life will benefit them more than you could probably ever imagine. And the benefits of drumming for toddlers, in my opinion (and maybe a little bit of research), outweighs those of most other instruments this early in childhood development. This isn’t to say that I believe no other instrument carries benefit for a child to learn to play it. But for toddlers drumming is about as simple as it gets, and then from there it can of course get more complex as they get better. But for now, the important thing is being able to get them started with little undue stress… which we will actually be talking about a little further into this post. Aside from being one of the simplest musical instruments for toddlers to pick up and immediately start playing, it also teaches them a wide array of skills such as the science of sound, how to count, how to share, and how to channel their energy into something creative instead of destructive. And what’s better is that all of it can be turned into one big game. 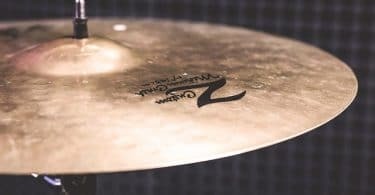 There are so many benefits to drumming for kids, let’s break a few of these benefits down and discuss them a bit more in detail. So, leave your child to his or her sleepy time while you do a little light reading. Grab that cup of coffee, kick off the house slippers and let’s dive in! What Are All The Benefits Of Drumming For Toddlers? Anyone, regardless of age, can pick up a drum set and start playing right now. It is by far one of the easiest instruments in the entire world to play! Oh, and that’s not to mention just how fun they can be to play as new patterns and rhythms are discovered. Drums are most certainly what I would consider entry-level instruments. Of course, you can get your toddler drumming right away without ever spending a dime. 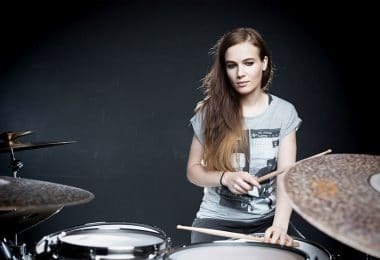 For more advice on how to go about doing that, check out this post we wrote about how to practice drums without a drum set. This mix of fun, physical activity and small learning curve makes the drum a perfect first instrument for any child. Ask any musician why they enjoy making music, and I can almost assure you that the majority of them are going to tell you it's because it allows them to express themselves. Everyone can benefit from expressing themselves in ways that words just cannot convey by themselves. There are a wide range of emotions that, we as humans, cannot help but to feel. Unfortunately, if we do not have an outlet in which we can release or express that emotion, it can wreak havoc on us. Well, toddlers are like little balls of emotion with no real way of navigating the world they are experiencing. They are growing those skills though, and it is our job as parents to try and foster that growth as much as possible… and as soon as possible. Many parents will tell you that there is no better remedy to anger and tantrums from your child than to give them a drum. When they start feeling frustrated, their drum becomes more than an instrument; it becomes a channel for all those confusing or stressful emotions. And a funny thing tends to happen when a toddler is given a drum when they are frustrated… They begin to calm down as they play. It's a combination of the sound, the instant gratification and the redirection of emotions into something joyful. They start to relax and focus more on making that beautiful sound again. Within a matter of just a few minutes, their temper-tantrum can go from being full-blown chaos to laughter and drum beats. Instilling this sort of impulse–control and decision making in times of crisis in your child while they are still in their toddler years will help ensure that they carry that skill with them throughout the rest of their lives. By giving your toddler an outlet in which to focus their frustrations, which they will undoubtedly experience often, you give them a way to bring those emotions to the surface and work them out in a safe and healthy manner. While drumming can certainly be a solo activity or one that you and your toddler share together, there is a rather large community of children’s drumming circles out there. Some are geared more toward drumming therapy for children, while others are more akin to toddler drumming classes. A quick Google search should be able to give you an idea of drum circles that may be gathering in your area. Participating in a drum circle can teach toddlers important social skills such as how to share, take turns with others, and how to begin communicating socially. Drum circles are great for teaching those types of skills in a very relaxed, low-pressure setting and gives your toddler a way to explore their creativity in a collaborative way. 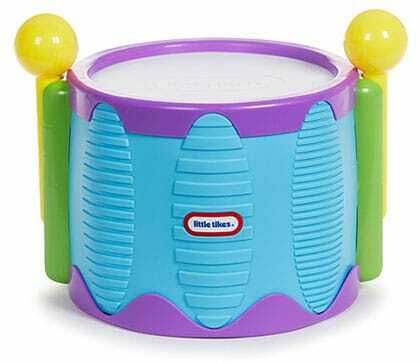 If you're buying a drum for your toddler just to see how it goes and if they will actually like playing it, I recommend taking a look at the Tap-A-Tune drum from Little Tikes. 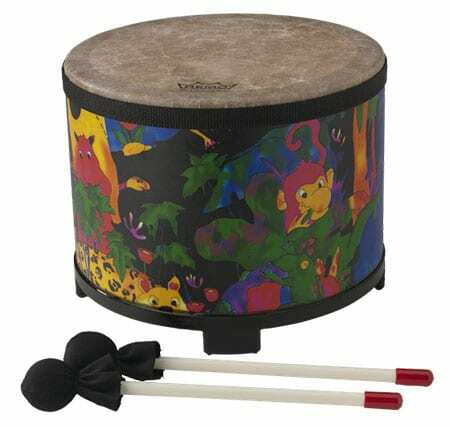 This is a very basic drum that is made out of a durable plastic that can hold up to quite a lot of rough play and it has been splashed with bright colors that is sure to grab your child's attention and keep them playing! The sides of the drum contain a few different raised ridges, or “washboard designs”, that allow for even more musical variety. Grab the two included drumsticks and start showing your toddler how to make unique sounds along the ridges. Or go completely freestyle and let them use their hands to slap out their big hit on the plastic head. No need to worry about it ripping, tearing or ever truly going out of tune. For the child who is taking their first steps toward becoming a drummer, you cannot go wrong with this entry-level drum for toddler. When your little-one is ready to advance to something a bit more advanced, the Remo Floor Tom-Tom Drum is definitely the next logical step! Tom-Tom drums are usually designed to either be played directly on the floor or included as part of a larger drum kit. This Remo Tom-Tom is meant to be placed and played on the floor. There is no need for your toddler to tilt it as it comes equipped with a plastic stand with feet to keep it lifted just high enough off the ground to produce a nice full sound. 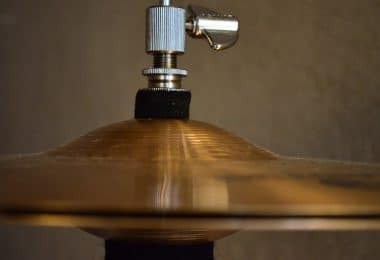 The shell of this drum is constructed from what is called Acousticon which is a proprietary type of material that Remo uses on a majority of their wood percussion instruments. It's a mixture made from a recycled wood fibers and resins. The head is made of a polyester material which isn’t going to suffer the same fate as a goat-skin drum head when it meets temperature changes. And it has enough stretch to it to be playable for years to come without losing much resistance at all. Best of all, it comes pre-tuned! 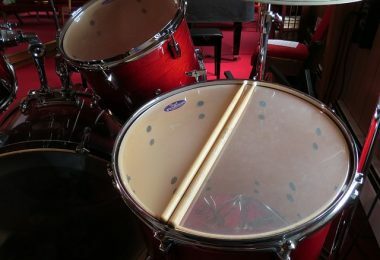 Finally, this drum comes with two beater style drumsticks so your toddler can play with their hands or the drumsticks. 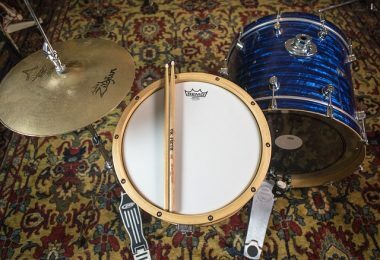 This drum pack is an absolute steal for what you get for your hard-earned money, parents. Aside from being just enjoyable to look at with their bright, rainbow colored outer-shells and matching mallets, these frame drums actually sound really nice. 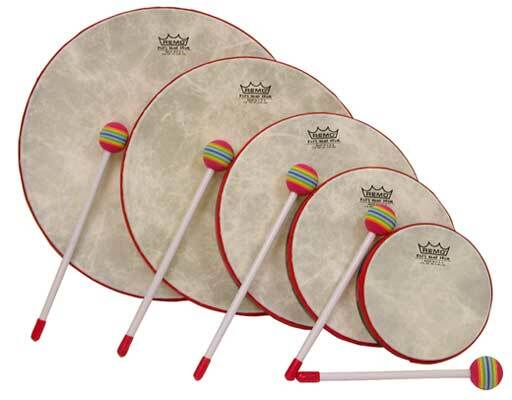 And a clear, pronounced tone is exactly what you should be looking for with frame drums like these as they are the perfect instrument for teaching your toddler all about different beats, rhythms, and patterns. Every drum in this pack features a pre-tuned Skyndeep drumhead to keep you and your kid drumming for hours on end! Drumming is an enjoyable musical talent that just about anyone can gain some benefit from. 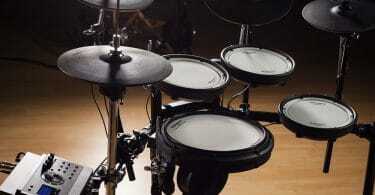 Whether it be for stress release, physical exercise, or simply for the sake of making music, drumming has got it all. A child’s first few years are when they are absorbing the majority of the skills that they will slowly begin to build upon as they grow up. In a way, you aren’t just giving your toddler a drum, you are giving them a foundation. You are giving them a tool and a skill that will benefit them. We have tried to cover the main benefits of drumming for toddlers, but honestly, it would be hard to list off every reason it is great for your little-ones. 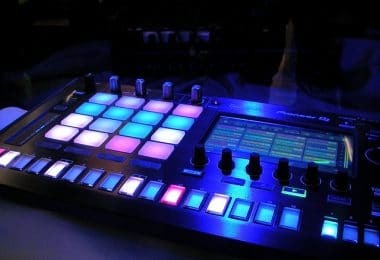 Not just because it would take us a month to write up that behemoth of a blog post, but because music is more than just a series of physical movements. Music is a feeling, it's an expression, and it's a way to give a voice to that which we cannot speak… or in this case, to those who cannot speak! Oh, and for all you parents out there who have a child or children that are a little bit older, check out our review of the best drum sets for kids.